A nice blog is written under EDUCATION, REMOTE SENSING & GIS section of scientiaplusconsrientia.wordpress.com, can’t wait to share it here. I first heard about OpenStreetMap several years ago but did not have enough time or motivation to explore it in depth. That changed last year when I found that I could fit OpenStreetMap data as background maps to a Garmin handheld GPS for use in hiking and bicycle tours (using data downloaded from http://garmin.openstreetmap.nl/). This worked perfectly, and irreversibly awoke my curiosity for this project. OpenStreetMap is a community-based mapping project on a global scale with the goal of producing and maintaining a complete and updated map that is free from legal and technical restrictions for use. OpenStreetMap implements a Open Data Commons Open Database License (ODbL). That means that one is able to use, modify and reshare the map and data, under the condition of giving credit to OpenStreetMap contributors, sharing under the same terms and keeping the data open. As the database grows in size and quality, the fact that the data are licensed in this manner makes the project an increasingly valuable resource. OpenStreetMap homepage showing the layers dialogue. In OpenStreetMap, any cartographer (amateur or otherwise) can contribute by mapping new features or editing existing ones. The resulting data can be used directly through its web interface, but it can also be advantageously integrated in websites, GIS platforms, and mobile applications. The potential uses are manifold. OpenStreetMap works for maps in the same way as Wikipedia does for facts. 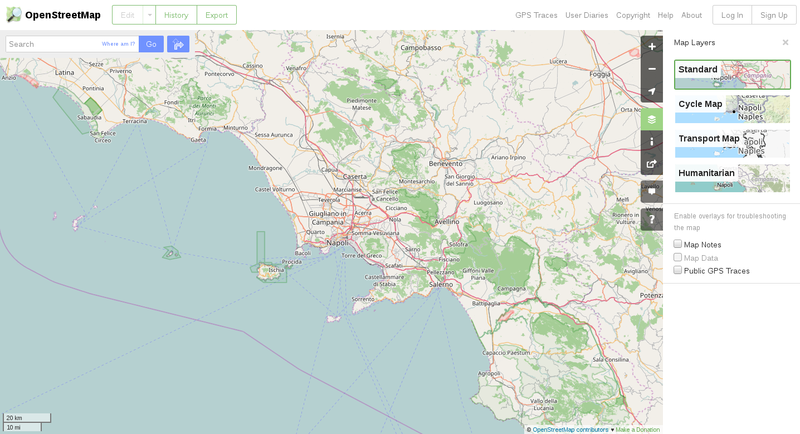 If you like cartography and open data, OpenStreetMap might be a perfect match for you. Southern suburbs of Buenos Aires, Argentina. 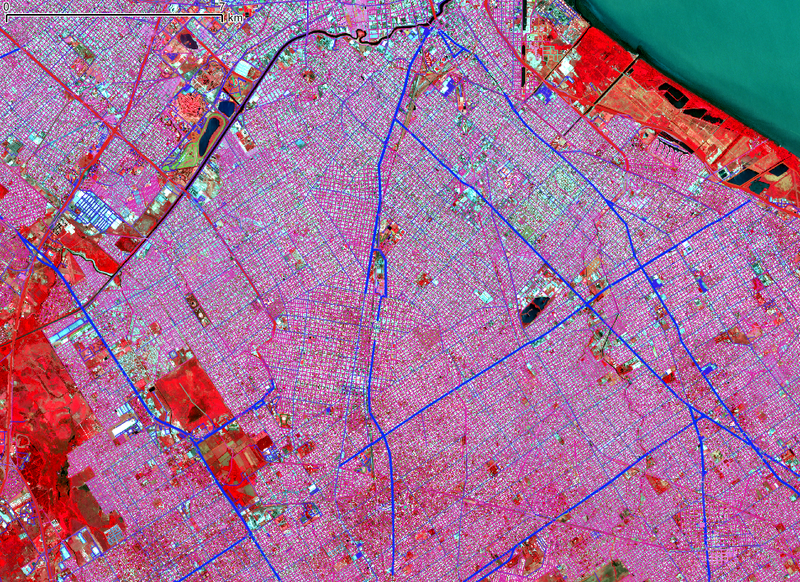 Streets and motorways as vectors from OpenStreetMap, superimposed on a Sentinel-2 image. Rendered in QGIS. 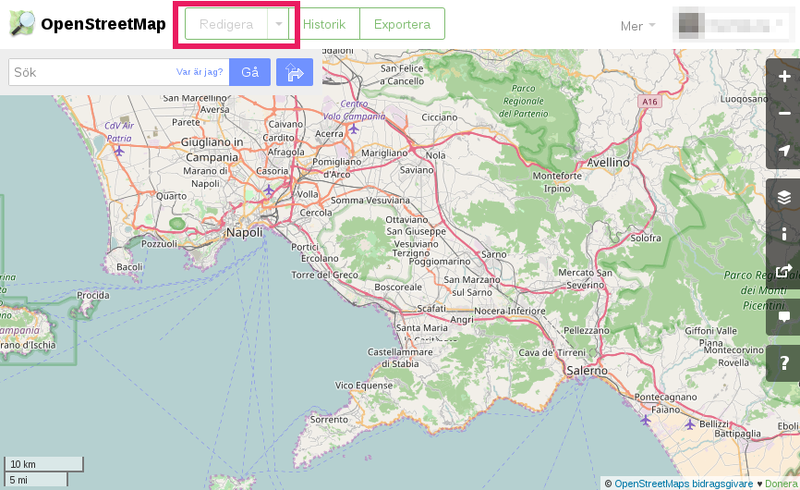 There are many things that can be told about how to use OpenStreetMap (OSM) data. We can just begin by the most basic of them, namely how can we start contributing to the map. Before we start, it is worth to mention that the basic idea behind OSM is that the world can be described using features, which are composed of tags attached to basic elements (nodes, ways and relations). It took a little while for me to familiarize myself with this model but it is easily understood after some reading and practice. Also remember that OSM is a community based project. As in any project of this kind, there is an important code of conduct agreed upon by the participants. Please respect it for everyone’s enjoyment and benefit. 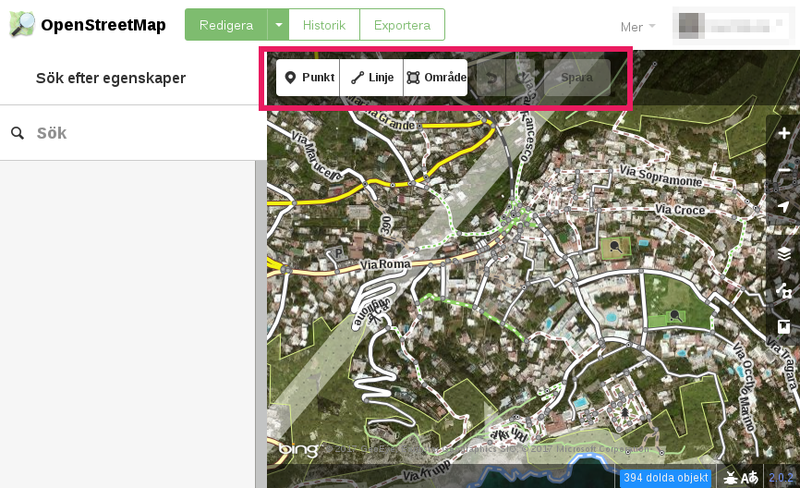 OpenStreetMap in editing mode (iD). 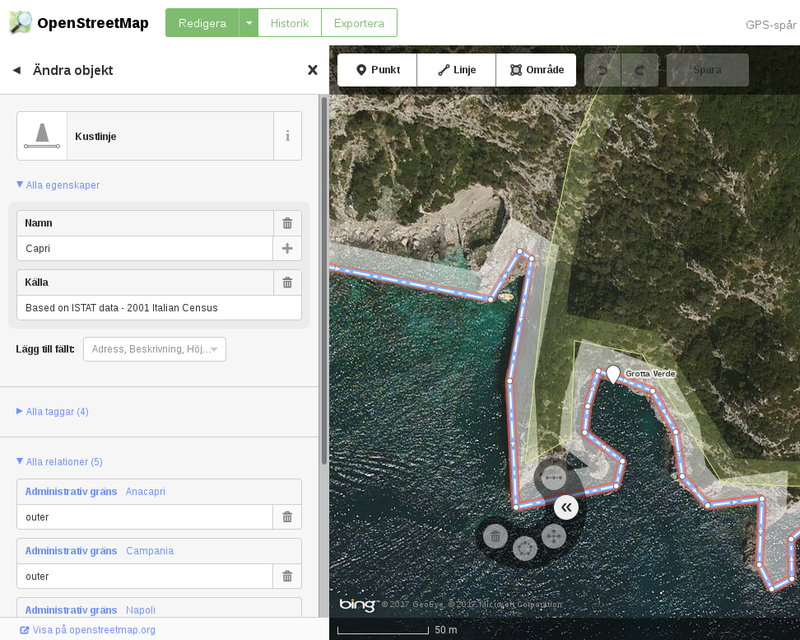 Clicking in an object, in this case the coastline of the Island of Capri, Italy, shows a menu to the left with the tags with which the mappers have marked this object. Also note the node editing dialogue next to the selected node. One can then proceed to add, move and delete nodes or features, as well as adding or modifying tags. After saving the edits the newly created features or the edits to existing features are committed to the database. After a while, the servers will show the updated view service in the main map. This simple recipe is the basis for a lot of the mapping work that goes into making OSM a great tool. Now think of all the unmapped features that may be present in your neighborhood or other areas you know well: hiking paths, bus stops, street names, forests, parks and a long list of etceteras. There are surely many potential improvements that you can easily introduce to the map. Go on and enjoy your mapping!